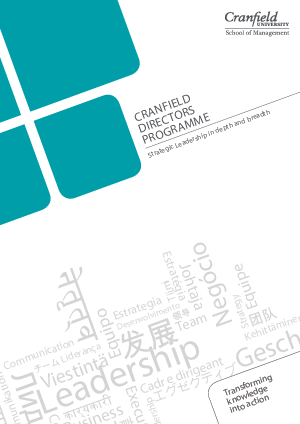 Senior executives who want to maximise business performance gain both personal development insight and practical business solutions from the Cranfield Directors Programme. The CDP is unlike other development opportunities for senior leaders. It offers the maximum personal and business benefit from a minimum but realistic time investment at a business school renowned for its practical relevance. Working with Cranfield’s most experienced faculty, the programme enables you to reflect on and develop your contribution as a director, to the leadership and strategy of your business. With an emphasis on translating learning into business benefit, the programme is noted for the high level of personal attention given to participants. As a result it is ranked as a world leader for the continued support it provides once participants return to their business.